Many of us assume that our creative process is beyond our ability to influence, and pay attention to it only when it isn’t working properly. For the most part, we go about our daily tasks and everything just “works.” Until it doesn’t. We treat our creative process like a household appliance. It’s just expected to work quietly in the background, and we lose sight of how much we depend on it until the day we’re stuck with dirty socks. Now business creativity expert Todd Henry explains how to unleash your creative potential. 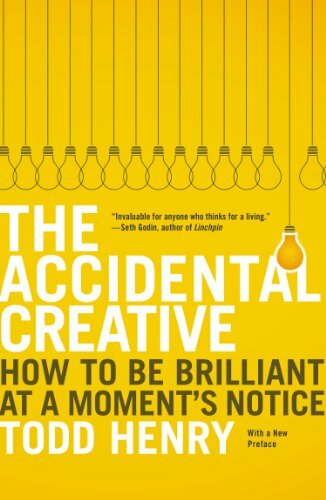 Whether you’re a creative by trade or an “accidental creative,” this book will help you quickly and effectively integrate new ideas into your daily life.The Accidental Creative offers a practical method for discovering your personal creative rhythm, whether you’re a manager or a consultant, a designer or a performer. • How to begin with your end goal in mind. • How to build stimulating relationships. • How to manage creativity as your most valuable resource. • How to structure the right inputs to maximize creative output. • How to focus on effectiveness, not efficiency. Here are a few highlights from the book. In some circles, the word “creative” has recently morphed from adjective to noun. If you are one of the millions among us who make a living with your mind, you could be tagged a “creative.” Every day, you solve problems, innovate, develop systems, design things, write, think and strategize. You are responsible for moving big conceptual rocks, crafting systems that form the foundations for future growth, and creating value that didn’t exist before you arrived on the scene. You may prefer the term “strategist” or “manager,” or something else that feels more concrete. Call yourself anything you want, but if you’re responsible for solving problems, developing strategies or otherwise straining your brain for new ideas, I’m going to call you a creative — even if you ended up being one accidentally. There are tremendous benefits to doing creative work. You get to add unique value, carve out your own niche in the marketplace and watch your notions and hunches go from conception to execution; could there be any type of work more gratifying? But the flip side of this is that whether you are a designer, manager, writer, consultant or programmer, you are required to create value each and every day without reprieve. The work never ends, and as long as there is “just one more thing” to think about, finding time to rest can be difficult. Your primary tool — your mind — goes with you every where. If your job is to create then you are always looking for new ideas. In addition, you won’t always have the option of going back to your desk to quietly brainstorm, vetting your ideas one by one. As a creative, you will regularly find yourself in situations that require you to generate brilliant ideas at a moment’s notice. To unleash your creative potential now and thrive over the long term, you need to establish your own rhythm — one that is independent of the pressures and expectations you face each day. This Creative Rhythm will provide you with the stability and clarity to engage your problems head-on. This rhythm is set by how you structure five elements: focus, relationships, energy, stimuli and hours. Focus. In order to create effectively, you need a clear and concrete understanding of your objectives.If you want to thrive in the create-on-demand world, you must develop the capacity to focus deeply. Though broad and shallow engagement may feel necessary because of the number of priorities on your plate, to be truly effective you must cultivate the ability to do quick, focused dives into the depths of a project and emerge with useful ideas. More important, this must be done in spite of the increasing pressure to do things faster, better and cheaper. The only solution is to stop living reactively and to instill a new practice of thinking deeply about your work: Lock in on the heart of the problem quickly (define), establish your game plan to center your activities around the most crucial priorities (refine), and organize your work so that you’re minimizing distractions and staying on course (cluster). Developing these practices will increase the number and quality of spontaneous insights you experience. Relationships. One of the most powerful sources of creative inspiration and rejuvenation is other people.There are three strategies that can help you be more purposeful about your relationships: circles, head-to- heads and core teams. Each is designed to help you achieve more interdependence, inspiration and accountability in your work. We are not wired to do life alone; the more we can network ourselves with others,the better. Start a Circle.Many of the greatest creatives throughout history have gathered in small groups to stay focused and engaged, and the practice continues to benefit those who go to the effort to instill it. It’s something that I’ve done for years, and it’s been an immeasurable source of inspiration and accountability for the work that I’m doing. These small group meetings can stoke your passion, help you stay aligned with what matters most, inspire and give you new ideas or directions for projects, and simply feed you emotionally in ways you may be lacking.The size of the ideal circle varies. Some people prefer a smaller circle for the increased level of intimacy it provides, while others prefer to have a larger group in order to leverage a greater diversity of thought and experience. While the composition of your circle will vary, you want to invite people whom you believe you will have the ability to connect with in a meaningful way and who also want to do better creative work. Head-to-Heads.One way to cultivate the benefits of friendly competition in your creative life is to establish the practice of head-to-heads.In a head-to-head meeting, two people get together, and each party is responsible for sharing new insights and new resources they’ve encountered since the last meeting. The discussion can be on any topic — a book you’re reading, a seminar you attended, something you made — but the idea is to share something that will be both intriguing and challenging to the other person and that will stimulate discussion. In some ways, the head- to-head provides accountability for you to maintain regular times of study and purposeful experience because you know that you will be required to share something you’ve done since the previous meeting. Establish a Core Team.I give quite a bit of latitude to certain people in my life to speak truth to me. Sometimes it stings, but the temporary sting of unwanted truth is much easier to bear than the harsh sting that comes after a prolonged period of living in a world of imagined vulnerability. I would much rather have friends inflict these wounds than cynics, critics or competitors, all of whom want me to fail.There are three people in my life who have full permission to speak anything they want to me and whom I regularly meet with in order to review my goals and my progress. I consider them my core team, and they are always my first e-mail when something good happens or when I need advice.Whom can you trust to speak the truth to you, no matter how hard it may be? Whom do you trust to say the things that no one else will say? You must have these people in your life if you want to continue improving your work. Energy. To make the most of your day, you need to establish practices around energy management.Energy management is critical to staying out of ruts. Like a gambler who falls behind and needs to wager bigger and bigger amounts to get back to even, the creative in the risky habit of ignoring energy puts himself in a seemingly impossible situation. But it’s never too late to build healthy practices around energy management. We can start making wise choices now about how and where we spend our energy to ensure that we’re not neglecting the important things in our lives for the sake of what’s convenient. It’s all too easy to waste the energy we need for important creative opportunities on unproductive or unfocused behaviors. Stimuli. The quality of the output of any process is dependent on the quality of its inputs, and this holds true of the creative process.There are three practices that I’ve found tremendously helpful for myself and my clients in processing and assimilating information in a way that will be useful in the creative process. The practices, which are designed to instill rhythm and purpose into the stimuli we absorb, can be divided into three categories: cultivate, process and experience. Cultivate.Maintaining a study plan will help you cultivate the kinds of stimuli you allow into your life and ensure that you are putting the most important pieces in place first. I have used one for years, and it has made a tremendous difference in my exposure to great thinkers, my understanding of key issues at work, and my ability to process new and complex thoughts. I consult and revise it regularly — typically in my monthly checkpoints — as a way to make sure that I’m continuing to challenge myself with the things I choose to allow in my head. The practice of deliberate study plays an important role in the development of your capacity to think and to process new information. When you assemble a study plan, you cultivate a queue of stimuli designed to grow your creative capacity. Your ability to synthesize new ideas is largely influenced by your depth and breadth of knowledge in diverse domains of expertise. As you study, you develop networks of understanding that connect bits of data in your life into meaningful patterns. Process.The goal of study is not simply to absorb a lot of new information. You want to process and assimilate it, then apply it to your life and work. If you don’t cultivate insights from what you take in, then the value of stimuli in your life decreases dramatically. Taking good notes on your observations, insights and experiences with a reliable thought-capture system prevents them from disappearing into the ether.In addition to making good observations and regularly recording them, you should also make a practice of regularly reviewing your notes to see if there are any potentially applicable insights. Many creatives I’ve worked with take copious notes, but they’re practically useless because they’re always moving on to the next urgent matter, and thus never bother to review them. Mar 16 Things you need to know about the book " What Matters Now by Gary Hamel"